Free weights effectively work the glutes and hamstrings. 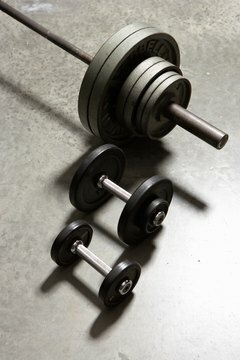 Free weights challenge the body in ways that are different from machines. You need a greater degree of stability and muscle recruitment when you do exercises with free weights. Several free weight exercises use this challenge effectively to target the glutes and hamstrings in particular. Though the quadriceps work as the prime mover when performing a squat, the glutes engage as a major assistor, especially as the legs straighten. The hamstrings engage as stabilizers through the range of motion, helping the major muscles complete the movement in proper alignment. The squat focuses load on the quadriceps and glutes most intensely, but the hamstrings are still engaged in the motion. Though commonly associated with working the back, deadlifts are actually one of the most effective full-body, free weight motions. Straightening the legs while lifting either dumbbells or a weighted bar from the floor immediately engages the glutes throughout the range of motion. Even after the legs are straight and the spine has straightened, keep the glute muscles tight at the top of the motion. The hamstrings perform as assistors in this motion as they do similarly in the squat. Unlike the full deadlift, the straight leg deadlift focuses primarily on the hamstrings. The legs remain straight -- though the knees are soft and slightly bent -- as the trunk hinges forward from the waist. Resisting the force of gravity to straighten the trunk again engages the hamstrings heavily. Good mornings follow a motion that is similar to straight leg deadlifts. Good mornings, which are similar to squats in some ways, are most commonly performed with a barbell across the shoulders. Unlike the straight leg deadlift, the weight is positioned higher on the body so greater resistance is encountered as the body hinges forward at the waist. The body stops when the trunk is roughly parallel to the floor as opposed to the fuller forward bend executed during the straight leg deadlift. The force that is resisted as the body straightens targets the hamstrings heavily in this exercise as well. You may vary lunges to work the lower body while you are using free weights. You may do them with either a barbell or dumbbells while stationery or walking. The basic motion of lunging engages the quadriceps, glutes and hamstrings regardless of variation. But slight variations in stance can shift the focus more towards working the hamstrings. Taking a wider stride with the lunge focuses work on the hamstrings, while a narrower stance targets the quadriceps. The glutes are used heavily as an assisting muscle regardless of stance variation. Start a lower body workout after you are warmed up. Exercises such as the straight leg deadlift and good mornings require a good degree of flexibility and are more appropriate for people who already have developed strength in the lower back and lower body. Always start with a lighter weight if trying an exercise for the first time and work realistically within any individual physical limitations. Consult a doctor before starting any kind of exercise program. What Is the Difference Between Conventional Deadlifts & Stiff-Legged Deadlifts? Do Front Squats Work Different Muscles Than Static Lunges? 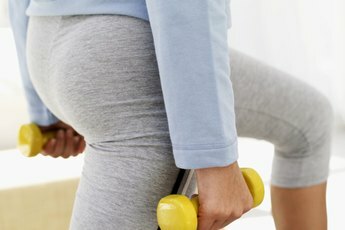 Are Lunges Good to Strengthen the Knee? What Muscle Do Barbell Squats Work Out? What Are Traveling Front Lunges & Alternating Front Lunges?